Courtesy of ed.gov - Thelma Meléndez of Santa Ana is expected to be named education deputy by Los Angeles Mayor Eric Garcetti. August 19th, 2013, 2:25pm :: Los Angeles Mayor Eric Garcetti plans to appoint veteran school district administrator Thelma Melendez de Santa Ana as his new education deputy, KPCC has learned. Vivian Ekchian, L.A. Unified’s Chief of Human Resources, said that item refers to Thelma Melendez de Santa Ana, who was hired by the school district at a $140,000-a-year salary. “The superintendent’s office informed us that she was processed about a week ago,” Ekchian said. But the district won't pay her salary. Instead, she'll be on loan to the City of L.A. as a Director of Education and Workforce Development. That would make her Mayor Garcetti's education deputy. Her one-year contract includes teacher retirement benefits, health and welfare, and 20 vacation days among other benefits. Her total compensation package is just over $151,000. The City of LA will pay the entire benefit, plus a 3% fee to the district. The unusual hiring arrangement is subject to approval by L.A. Unified’s seven-member board of education at Tuesday’s meeting. Melendez de Santa Anna declined to talk to KPCC about her new job – it hasn't been announced by the mayor's office yet. Garcetti's spokesman did not respond to requests for comment. The arrangement is outlined in a "Letter of Agreement" between City and school district officials dated Aug. 13. According to that document, her duties include advising and assisting the mayor "in coordinating with LAUSD and stakeholders including LACCD, WIB, Business Associations, Research/Academic Institutions, Foundations, Entrepreneurs and others to lead Los Angeles residents to become more competitive for job and higher education opportunities." Melendez de Santa Ana retired this year as Superintendent of Santa Ana Unified and was Superintendent of Pomona Unified four years ago. She was also a former top official for U.S. Secretary of Education Arne Duncan. That suggests she's a supporter of charter schools and using student test scores to evaluate teachers - policies favored by L.A. Unified Superintendent John Deasy. Melendez de Santa Ana’s resume also includes a fellowship with the Broad Superintendent’s Academy in 2006, the same year Deasy was a fellow there. smf: I don’t have an issue with Mayor Garcetti having an education deputy or that that person is Dr. Melendez de Santa Ana. I really don’t have an issue with the pass-through payroll arrangement so Dr. Melendez can accrue hours with the California Teachers Retirement System (CalSTRS) – something she would not be able to do if she were on the city payroll. In her zeal to protect her own Pension+Benefits I hope she stands up for the benefits of others! 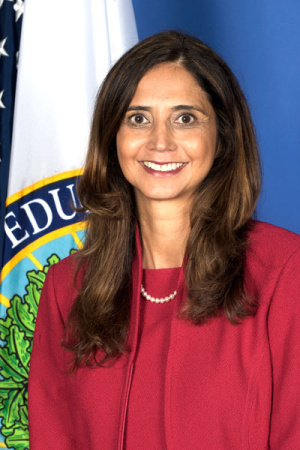 As the article describes, Dr. Melendez is well connected to Arne Duncan and the US Dept of Education – though she didn’t stay there long. She has been superintendent for short stints in Pomona and Santa Ana. She has that Broad connection – but we all know that and I’m sure the mayor is under some pressure from Eli Broad+Co. to make this move. The fact that Dr. Melendez did not last long at any of those previous jobs is worrisome – but average job longevity of all school administrators from principals-to superintendents averages about two years. That is unfortunate! The state constitution and the city charter mandate separation of the school district and city government. The single official point of contact, interaction and cooperation between LAUSD and the Mayors Office is his appointee to the School Construction Bond Citizens’ Bond Oversight Committee – because of the payroll arrangement Dr, Melendez is disqualified from serving on the BOC because she will be in-fact-and-law an LAUSD employee …and that is unfortunate. If Mr. Eli Broad thinks he has placed Dr. Menendez in the wings should there be a vacancy in the LAUSD superintendemts office I just want to say ‘Good luck with that!’ The mayor of Los Angeles was instrumental in the selection of the last two LAUSD superintendents without there being a public search and/or a transparent selection process. I don’t see that happening again. No way, No how. I expect the board will approve the payroll pass through. They should.